Unless you’ve been stuck under a rock or voluntarily living underneath it, you’ve probably heard of Nvidia’s Shield line of products. 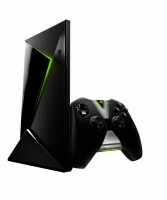 The first and second iterations of the product line involved a tablet paired with Nvidia’s own game controller for portable gaming. The latest incarnation no longer aims to travel with you but is designed to transform your entertainment center, more specifically, the TV. Based off Android TV, Nvidia’s Shield comes installed with TegraZone, which contains all the Google Play store’s Tegra-optimized games curated in a single location. Basically, it does what all Android powered devices can do but with gamers in mind. As you can see, connection options are provided in spades. 4K gaming? Yes please! Expandable memory? Heck yes! Paired with the game controller that is included, the Shield effectively transforms your TV into a smart TV/gaming console. On top of all of the above, you can also use GRID service to stream triple-A titles to your console. Sounds pretty good for something that starts at $199 MSRP. Nvidia has a chance to really corner this market. There aren’t too many devices out there that can compete at the level Nvidia plays in terms of gaming – it’s their bread and butter. I’ll be looking forward to seeing the Shield console in action when it’s released in May.